Is gluten actually bad for you? In this episode, John Douillard explains how wheat isn’t the enemy so many people have made it out to be. After this episode you may learn that you can eat wheat again as long as it is the right type. John Douillard is a globally recognized leader in Natural Health, Ayurveda and Sports Medicine. He directs LifeSpa, the 2013 Holistic Health Center of The Year. He’s a best-selling author of 7 health books including, Eat Wheat, a proven approach to safely bringing wheat back into your diet. Learn more about John HERE! Hi everyone, it’s Robyn Openshaw, and welcome back to Your High Vibration Life. And today I have a very special episode with you about something very controversial. I was on a beach in Mexico with my girlfriends for my birthday recently, we were celebrating my 50th birthday, and it was my girlfriends birthday as well. And, we’re sitting on the beach, and my girlfriend is reading a magazine called I think “Spirituality”. And I looked over her shoulder, and she was reading a book called “Why, When, and How to Eat Wheat”, and the thesis of this was this whole gluten free craze is way off, and we don’t have a problem with wheat, we don’t have a problem with gluten. We have some completely different issues, and so to dive into that today I think is very important because you’re gonna learn some things about wheat that you didn’t know and you may just be able to eat it again. I want to introduce to you, Dr. John Douillard. He is a globally recognized leader in the fields of natural health, Ayurveda, and sports medicine. He directs LifeSpa, the 2013 holistic wellness center of the year in Boulder, Colorado. And he’s the creator of LifeSpa, the leading Ayurvedic health and wellness resource on the web with 5 million views on YouTube. He’s the former Director of Player Development and nutrition expert for the New Jersey Nets NBA team. 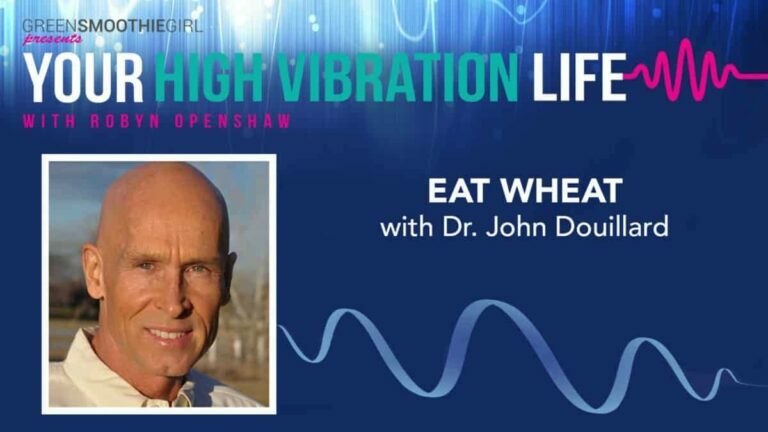 He’s a best selling author of seven health books, including his latest, Eat Wheat, a scientific and clinically approven approach to safely bringing wheat and dairy back into your diet. So, welcome, Dr. John Douillard. Speaker 1: Hey there Robyn, good to be here, thanks for having me. Robyn: Well, my pleasure. So I was so excited to connect with you because one by one all these anti-gluten books keep coming out, last weekend here in Utah where I live there was a gluten free expo. And you’ve shared with me that $16 billion dollars a year are being spent by Americans on gluten-free products, and I think that you and I share the opinion that gluten-free is a fad and there’s something else beneath it that I’m excited to explore with you. And, just to give a quick little backstory, my readers or longtime followers know that I healed myself of severe thyroid disease, obesity, 21 different diseases. I was having mini strokes, I had a tumor, I was losing my eyesight. And making the shift to eating wholefoods, mostly plant-based, most weeks, most months, entirely plant-based, is how I recovered my health. Now, I don’t really care if people eat meat or not. I do care if they eat whole foods because it’s really just the path to health. And you know, grains and legumes were an enormous part of my healing journey. And I really feel like there are tens of millions of people all over the planet, and you’re a student of Ayurveda, so you’ll relate to this, especially in India and all over Africa, these are people who don’t have means and people who don’t have a lot of money, and live close to the land and people who don’t have access to the Western diet and packaged foods, eat pretty much nothing besides greens, vegetables, and grains. So tell us a little bit of how you got so interested in educating America that grains are actually good for you, tell me more. Speaker 1: I started in practice in 1984, and even back then people would come into my practice and say they have digestive problems, chronic fatigue was big back then, candida was big back then, probiotics were big back then. And, what I realized people come in and they can’t digest things and say, “Well, get off wheat and dairy.” That was something that we knew 35 years ago. And then people would get better and then they’d come back three or four months later and say, “Doc, my problems are back.” And say, “Well, try getting off of soy and other things, nuts and seed nuts maybe.” And they get better and then the problems will come back. And it didn’t take long being in practice, and my goal in practice was get people better, not give them a panacea or a pill or a powder. So, it made very clear that wheat in foods were not really the problem, but it was something else, a broken down digestive system that was allowing foods that might be a little more challenging to digest, which in a minute we’re gonna see how it turned out to be really important for us. But, when you can’t digest foods and we then are fed a diet, for the last 60 years, of processed foods that are sort of predigested for us, we lose our digestive strength, our digestive system sort of literally goes on welfare. It stops bothering to digest, if we’re not asking it to digest. And I get it, people who eat wheat, they don’t feel wonderful, they have issues. There is a 16 billion dollar marketing plant in New York that’s telling us that really, that you can eat wheat you’re gonna gain weight. And reality is that the science is amazing. Science is amazing, science is why I really wrote the book “Eat Wheat,” because the science was so different than what was being talked about in the best selling media. The science shows wheat, whole wheat, not refined or processed wheat, lowers the risk of Alzheimer’s by 53% in the Mediterranean diet, 54% in the Mayan diet, which is three servings of whole wheat or whole grains per day, lowers the risk of type 2 diabetes in study after study after study. And this week, a huge study was just released measuring that, people that eat … There was a 30-year study of over almost 200,000 people and they found that people who ate the most gluten, the most gluten had the lowest rates of type 2 diabetes, and people who ate the least amount of gluten had the highest rates of type 2 diabetes. And this is a really interesting phenomenon no ones really talking about. Is it okay that we just take a food group that we’ve been eating for three and a half to four million years, and there’s science to back that up, right out of our diet? That is what we’ve been feeding on for the last 60 years, slowly taking these undigestable fats in higher and higher quantities breaking down our digestive system to the tune of now, those fats congest your liver and the gall bladder and the number one elective abdominal surgery in America today is gall bladder surgery. So, all of a sudden, everybody’s getting their gall bladder taken out in record numbers because the gall bladder’s so thick and congested, as is the liver, with this undigestable Omega-6 processed fats that we can’t digest much of anything. And you can’t break down your fats with your gall bladder, that’s what affects your obesity levels, it affects your mood, and it affects your blood sugar stability because the reality is that type 2 diabetes is a liver condition primarily, not a pancreatic condition. So there a lot of reasons why I really wrote this book. One is to stop the craziness, and I think the most important thing is that people don’t understand that just taking wheat out of their diet, it might make you feel better short-term but it isn’t solving the real problem. And your ability to digest well and digest hard-to-digest foods is directly linked to your ability to detoxify. And we have four billion pounds of toxic chemicals dumped in the American environment every single year. We have been pre-lacing every organic vegetable to whether you eat organic or not, and you should of course eat organic, but you can’t avoid the chemicals is my point. And then the mercury is fat-soluble. So if you can’t digest well, you can’t detoxify well taking wheat out of your diet, a next thing out of your diet or becoming a vegan or a vegetarian, or raw food, because you don’t digest well and you’re looking for some dietary solutions to solve your problem with the next best selling yo-yo type diet. And you feel better for a little while, but then you fall off the diet because it’s stopped working. This is what’s been happening for 30, 40, 50 years. It’s time for us to treat the real problem, and the real problem is that, and there’s a lot of reasons and ways to navigate this, and I would love to talk about this in detail, but how to reboot the digestive strength, how to navigate around the process is, like Robyn said: eat whole foods. But boy, gotta be aware of what is whole food and what isn’t whole food, it’s very tricky, and then reboot your digestive strength [00:08:58] improves your nerves, and that’s the whole point of my book Eat Wheat and to kind of stop the craziness, and make sure that people aren’t setting themselves up for real serious problems down the road by thinking wheat was the new public enemy number one. Robyn: Okay, so getting off of wheat makes people feel better sometimes, and they think it’s because wheat is bad for them when really, they just stopped eating inappropriate versions of wheat, or processed wheat where we threw away the bran and the germ and we dumped a bunch of chemical vitamins in it maybe, and maybe we ate it three times a day. All of this I got from you, and I have some interesting questions I wanna ask you from my reading your work, but what you’re saying I think, just to get clear on this, is that getting off of wheat products and feeling better doesn’t mean wheat is bad for you. Because you’re just stopping the flare up of inflammation temporarily, but you didn’t solve the underlying gut issue, which is related to a lot of dietary problems Americans are causing themselves with our diet, is that right? Speaker 1: Yeah, absolutely. I mean for example, there was one study, they took Kamut wheat and it was one of the ancient grains that they’re still growing today. And they found that Kamut has twice the amount of gluten as some of the modern strands, twice the amount of gluten. But that grain, with twice the amount of gluten, had twice the reduction of inflammation. It actually reduced the risk of diabetes and therefore … it had twice the … and reduced the inflammation, and it had twi … and also reduced cholesterol, that’s what I was forgetting. Yet, it had twice as much gluten. There are studies, studies that show that when people eat a gluten-free diet, versus people who don’t eat a gluten-free diet. We’re talking about, in general healthy people. And four times as much mercury in their blood when they eat gluten free than when they eat wheat. They have significantly less good bacteria, and more bad bacteria, than people who eat wheat, and that’s another study. In one more study, they found that people eat a gluten-free they have significantly less killer T-cells, a measure of immunity, than people who eat wheat. And they found evidence of gluten in the teeth of ancient humans straight after four million years ago, and it had significant amount of grain. In fact a study at University of Utah, when they found these studies, they said that the ancient humans, three and a half million years ago, they’d gather enough wheat berries in two hours to feed them for an entire day. And we didn’t start hunting and cooking our own meat until 500,000 years ago, most agree, so that’ll be give or take a couple hundred thousand years, but that’s what they believe. When we have evidence of three and a half to four million years of eating wheat, we have almost two million years more evident, more and in genetics were eating wheat than they do meat. And it’s so funny, we were talking about this earlier, how everybody can’t digest grains anymore because their digestion’s been broken down from the processed foods. It’s going to a Paleo diet, which is meat three times a day. And there’s no paleolithic person on the planet, living in the Paleolithic Era, that ever ate meat three times a day, it simply didn’t happen. And they absolutely did eat grain, because they could take them off the wheat berry. And when they originally started to hybridize the wheat, around 12,000 years ago, they wanted the wheat to be bigger. They wanted the berry to be bigger, because it was easier to get and find. Otherwise, they’re needle-sized, you can lose them in the dirt. So I want a bigger grain. So what they did, they sort of selected for bigger grain. When they selected for bigger grain, guess what they were selecting for? Less gluten and more sugar. The original hybridization of wheat had nothing to do with increasing gluten content. It had everything to do with increasing sugar content. The problem has been sugar from the very beginning and it still is sugar today. It’s not a “Wheat Belly” issue, it’s a sugar belly issue. And then the other argument, and I get this off my chest really quickly, says that ancient grains are way better than modern grains, and modern grains are hybridized and genetically modified and all of these things: it’s not true. There’s no genetically modified wheat, they did some tests, but they’re not being … they’re not in our food chain at all. They did studies at University of Saskatchewan, for example, a nineteen-year study measuring ancient strains of wheat from the 1800s to modern strains, and they found absolutely no genetic difference. And I have read the articles and the studies that are written in Wheat Belly, and there are a lot of interesting, flawed, skewed ways that that science was interpreted. There is really very, very little evidence that a whole wheat does anything except lower your risk of type 2 diabetes, in study after study. I would challenge anybody to find me one study that shows that whole wheat increases risk of diabetes. And that is the case that the Wheat Belly is making, and David Perlmutter’s book the Grain Brain is making. That wheat has a high glycemic index, and therefore acts like sugar, and therefore increases the risk of Alzheimer’s and increases the risk of obesity. However, the studies show that whole wheat has a low glycemic index. Refined wheat may have a high glycemic index, but so does every single refined food we eat on the planet. It’s like you say, Robyn, we gotta get all of it our diet, not just the refined wheat. And when you eat a whole grain, it lowers the risk of obesity, arthritis, cognitive decline, Alzheimer’s, and type 2 diabetes in study after study, over 600 references in my book, because I was blown away by the amount of science that says that wheat is actually okay. Now, we gotta get to the point: okay, how do I get nonprocessed wheat? Well, look at the ingredients for sure, and wheat … to make bread, for example, takes whole wheat, water, and salt. That’s all you need. And that’s all that should be in the ingredients is those three thing. An organic starter helps, and if you take a fermented bread that can take up to three days to bake. Three days, from start to finish, for the loaf of bread, the whole wheat organic loaf of bread on this counter in this grocery store that stays squishy for days and weeks and maybe months, takes two hours to bake from beginning to end. I really can’t how many patients have come to me who can’t eat wheat, [inaudible 00:15:12] even meat, or dairy, or anything with a hard advanced protein, gluten, nuts, seeds, legumes. All grains. And when you take all of that out of our diet, where is the immune stimulation that has been boosting our immunity for millions of years? We have microbes in our mouth, esophagus, stomach, small and large intestine specifically engineered to make enzymes to digest wheat. Specifically for wheat! Not the … other grains have other enzymes and other microbes. So when we just take it out of our diet, and that wheat has been now shown to boost immunity, and we just take it out as if nothing is going to happen, we’re going down the exact same road we did 60 years ago when we took cholesterol out of our diet and that gave us the omega-6 bleached deodorized process, preservatives and replacement, and today they’re giving us processed gluten-free foods, which are more of the things that got us in the mess in the first place, which is more processed foods. We really have to stop the craziness and start demanding whole foods. Robyn: Yeah. I agree, and don’t forget to mention when we got our tropical oils blacklisted, these cold-pressed organic beautiful medium-chain fatty acids that we ran butter and coconut oil and palm oil out of town and instead we have this refined deodorized horror that is vegetable oil. So, so many things like that are related to what the food industry has fed us along with a story that ends up being just marketing. Okay, so you’ve covered a lot of amazing points that we just touched on, so I want to review a few of them, and then I want to get into what the real problems are with grains, because once we understand that, then we can eat grains again. And who doesn’t like eating grains? They’re an important part of life. Let’s start with number one thing I want to just review is that Dr. Douillard has said 3.4 million years ago, he’s referring to a University of Utah study, that’s my alma mater and grad school, 3.4 million years ago, ancient man was eating grain and his teeth prove it. It’s only half a million years ago that people started eating meat. And so what does this do, really fast tell me this, what does this do to the whole idea of the Paleo diet? Speaker 1: Well, you know, if you ask any anthropologist what the paleolithic people ate, they will tell you in short order, they ate nothing that is recommended in the paleo diet. I mean they ate meat, but they ate meat like they would kill a rabbit and scavenge a little here, a little there. They eat meat once … wooly mammoth they’d have a feast, that, and then famine for a period of time. They ate grains, they ate tubers, they ate nuts and seeds and [inaudible 00:17:58] combination of many, many things but it wasn’t meat three meals a day, guaranteed. It was much, much, much less meat, and it was many, many more starches. In fact, the enzyme amylase, which is only for digesting starch, by the way, we evolved as humans around two million years ago, to genetically make our own amylase. Prior to that point, we didn’t have the enzyme amylase. And what’s really interesting is, today after all these years, our amylase enzyme is cyclical. It’s circadian. Which means that it increases in our bodies in the fall and the winter, and it decreases in the spring and the summer. And just take a wild guess when grains were harvested for the last, up until very recently, for the last couple of million years? Robyn: Right, in the fall. Speaker 1: Yeah, in the fall! So we have enzymes specifically for wheat, and deficiency in this enzyme, and some people have that, is actually linked directly to what’s called baker’s asthma. People who don’t have amylase can’t digest wheat, they have allergies to wheat. That’s a real thing. But most everybody else has plenty of amylase, we’ve genetically [inaudible 00:19:13] make it for millions and millions of years, and it’s specifically amping up in our bodies in the fall to digest these very important foods. And why do we need grains in the winter, from a circadian perspective, Robyn, is so important. It’s that, at the end of the summer, when all the carbohydrates and the fruits and the sugars and the grains and the nuts and the seeds, are all being harvested, those are going to provide us with a whole extra dose of carbohydrates, we actually sort of go a little diabetic, and the extra sugar we can’t use gets stored as fat. And that’s the insulation for us to move into winter, and it’s a natural phenomena. Then you go on to the spring, which is a low-fat season, there’s no grains, we are in, now, as we speak in April, it is a low-grain, low dairy, low nuts, seeds. It’s leafy greens and sprouts and root vegetables and burdock roots and things like that. So it’s a very austere time there, and that resets that burning as a natural source of fuel and gets us off the carbs that we’ve binged on at the end of the summer, and had enzymes to digest them at the end of the summer. So it’s really interesting how we’ve vilified grain when without them we would never have been able to make it through a long winter without storing some of the grain so we could nibble on throughout the winter. And then basically it’s hit or miss whether we’re gonna make it through the early spring and get to the summer harvest before we run out of food and die of starvation. Robyn: Fascinating. Another controversy you’ve touched on is you, I’m pretty sure you said that anti-nutrients aren’t a bad thing. We have so many practitioners, even the holistic or functional practitioners, who probably just through their own ignorance of this subject have scared all their patients off of eating any foods with antinutrients. So I just want you to drive that home. You mentioned the antinutrients have an important function. I read a big long book about this years ago, I was looking through my bookshelf. I didn’t find it before our interview, but basically the jury is still out. And lots of science shows that these antinutrients like phytates and oxylates, are they friend or are they foe? Speaker 1: They’re definitely friend. If anybody would just open up PubMed and type in “phytic acid research” you’d find so many studies suggesting that phytic acids actually are quite good for you. Now, on the surface, yes, they do block the iron and calcium and some minerals. But when you actually look at groups of people who actually eat a high-phytic acid, high-grain diet, they have no iron deficiencies, in fact mostly at 41%, more iron than people who actually were on a low-phytic acid diet. So that doesn’t make sense, right, that the body over millions of years has figured this out. People say, “well, [inaudible 00:21:51] you get osteoporosis.” That’s not actually, doesn’t really pan out, because people who are on a high phytic acid diet, who eat a lot of grain in their diet, had the lowest rates of osteoporosis on the planet. So, that doesn’t really pan out. So then the cases that they make against phytic acid, are just sort of amazing to me. Because there’s really not in fact any real solid science, and the fact that phytic acid has been shown to lower the risk of colon cancer in numerous studies. So these phytic acids, these antinutrients, are the immune triggers that we’re talking about. And when you globally sterilize the diet like we did with our microbiome, that was bad idea. Now we’re sterilizing our diet, people can’t digest much of anything, and the science is beginning to show that it is a really bad idea, and we better stop doing it, because the last time we did that we’re looking at diabetes, depression, broken down digestions, gall bladder congestion issues. Taking out your gall bladder. Now we’re going to eat even more processed foods and take grains and nuts and seeds and the gluten out of our diet, which is really what’s going to do because people can’t digest … they’re going to get weaker and weaker at digesting when they eat gluten-free highly processed foods, and then we’re looking at a real compromised immune system down the road. And that is not the road I would like to hope, going into the next 50 years on this planet, because it’s … we need the strongest immune system that we possibly can have. Because these bacteria are becoming resistant to the antibiotics, and we’re gonna have to figure out a new way to protect ourselves from the bacteria that are constantly attacking, even in the dirt and the soil, the bad bugs are constantly attacking the good bugs. It is battle. I wish I could say it’s so peaceful down there. But there’s a microbial battle that takes place every single day inside of us and in the soil. And we better make sure that we are amped up with evolutionary skills and fuel to fight, to continue to fight, that battle. And by taking things out of our diets globally and replacing with predigested foods like processed foods is … it’s dumb. It’s really just … there’s no other word for it than just dumb. But the people are dumb, they [inaudible 00:24:06] when they eat it. But they’re just being told the solution is wheat, and it’s simply not. It’s something else. And “don’t eat wheat,” yeah, until we fix the problem. But then you can go back and eat real wheat, not the processed wheat. Robyn: And I want to get into what the best ways are to eat wheat, because one of the things that I’ve learned from you is that eating processed wheat three times a day like people are doing, if they’re eating toast and donuts and bagels and cookies and cakes and the forms of wheat that Americans are eating, year-round, like you said, we tend to produce amylase for fall and winter, and I’ll get into Ayurveda a little bit because I know you are an international known Ayurveda scholar and practitioner. But I want to cover one more thing in terms of the controversies that you’ve touched on that I want to drive home, and that is, I actually learned this from you, I did not know this, but you talked about how Kamut, which is trending in health food stores and earthy crunchy people, health nuts like me, buy Kamut because it hasn’t been hybridized, because it’s an ancient grain. But we actually were being taught 20 years ago when it kind of first started, people started marketing it in the health food world that issue with it is that unlike durum wheat that’s been hybridized over and over and over again, Kamut actually has more gluten. But what I learned from you is that Kamut actually has twice as much gluten, and it causes very, very little inflammation. Fascinating, because this calls into question the whole entire gluten debate. Speaker 1: Yeah. I mean the grain with the most gluten has the least inflammation, it doesn’t make any sense. In fact, I actually interviewed the only grower of Kamut wheat on one of my podcasts, he was amazing and some of the studies that he did, he’s actually a researcher as well, and there’s so much science out there about the Kamut grain actually lowered the risk of type 2 diabetes but all whole wheat does, but it also lowered the pain reactivity from IBS, it helped to steel up the intestinal skin from leaky gut syndrome. So here’s the grain that everybody blames leaky gut syndrome on, is actually healing leaky gut syndrome, healing IBS. It doesn’t really make any sense, but studies show that wheat is a natural probiotic and a natural prebiotic. So it actually facilitates the growth of numerous microbes in your gut. And we have enz- … like I said, from the mouth all the way down to the bottom of our digestive system we have enzymes. So it’s almost like, wheat’s going through, everybody takes their shot at taking their piece of it because everybody wants it and whatever is left over of the gut goes into creating the fiber, the wheat fiber gone into making food for the microbiomes that feed it in massive quantities [inaudible 00:26:58] in your large intestines specifically engineered for breaking down gluten. Not eating … if you’re having digestive issues, stop eating that and stop eating … But it doesn’t … if it hurts, stop doing what makes it hurt. And then everything’s [inaudible 00:27:13], and it’s just amazing that that’s what we’re being told. And it’s not good, the real problem is about to come. Robyn: Well, not only is it not enough to keep taking the symptoms away but then those little taps on the shoulder that nature or God or whoever is doing this is trying to get us to pay attention to then we don’t pay attention to it and the underlying problem gets worse, and so these are some great ideas towards revisiting the way we think about food in general. We’ve talked about what maybe the problem isn’t with grain, okay, because there’s entire books written on how it’s the gluten in wheat, it’s the gluten in grains, and then we throw out the entire class of grains. And you know a lot of grains that I eat aren’t even really grains, you know they’re seed fruits, they’re … they don’t even have any gluten in them, you know, they might be grown in Africa, now that we’re such a global economy. But tell me what are the real problems with grains towards telling us then what is the appropriate way to eat them? Speaker 1: Well, I think that the reality is that like I said that they have antinutrients, which protect the grain from fall through the winter into the spring when they harvest and those antinutrients area little bit challenging to digest. And so as a result of that, we really do need a very strong digestive [inaudible 00:28:30] that hydrochloric acid in our stomach. But that’s only going to happen if we have a lot of really good bile flow in your liver. So that usually the kingpin and the thing that I start with is how to reboot and repair your liver and your gall bladder function. And then because if these go undigested in the stomach into the small intestine they’re too big to get into the bloodstream the way they should, so they get uptaken into the collecting ducts of your lymphatic system. And the lymphatic system is trying to deliver fats as energy to every cell in your body. And if the big undigested proteins and mercury and toxins and chemicals are all clogging up, and gluten undigested and very undigested, [inaudible 00:29:16], they’ll clog up the lymphatic vessels and all of a sudden the ability to deliver fats as energy is compromised and you all of a sudden have either a food coma or chronic fatigue syndrome. The lymphatic system is also trying to deliver energy into every … energy but also immune system, is carrying our immune system. If that immune system gets stuck in traffic, that immune response is, you have hyper immune responses. You have lymph underneath your skin and that becomes an exit ramp for the impurities that can’t get out through the appropriate channels because your lymph is trying to detoxify you, and you get rashes and hives. And then the real culprit, sort of the “Brain Grain” culprit, is that there are brain lymphs, there are lymphatic vessels in your brain that drain three pounds of toxic chemicals, in fact, out of your brain every single year. And if the lymphatics around your belly where most of it starts is congested, eventually the brain lymphs will be congested and they drain while you sleep at night. You don’t sleep you don’t drain, you don’t drain you don’t sleep, and then people start having brain fog, cognitive decline. In fact, studies show that people’s brain lymphs get congested, it’s very common, it’s leading to inflammation, infection, anxiety, depression, cognitive decline, and autoimmune condition. Those are all the things that people say wheat causes, and wheat did not cause the lymphatic congestion of the brain or the lymphatic congestion around your belly that makes your belly swell. It didn’t cause the rashes on your skin it was undigested, it was poor digestion that let a lot of undigested proteins go through, and then act as immune irritants or stimulants because they shouldn’t be there in an undigested form. So it’s not rocket science here, let’s just reboot the digestive system and stop letting that wheat go through undigested, eat it in a seasonal way, eat in a whole food form, reboot digestion, troubleshoot where you’re broken down, and fix it! It’s not hard. Robyn: Well, and there’s one other issue that you talk about in your book quite a bit: that, as I’ve tried to explain why so many people are led down the gluten-free path and you’ve explained that people who eat gluten-free foods and don’t eat wheat anymore have four times the mercury levels, and mercury being the second-highest toxic substance on the planet that’s sort of scary. And then they have less T-3 killer cells. But also I have talked to people many times who have issues with wheat sensitivity who live here in the US and they go to France and they find that they eat a croissant and they can’t believe that they don’t have this gut ache. And I believe that you’ve had the same experience. I’ve heard this many, many times directly from people who have the different experience. So this can’t be explained, because a croissant, and we’re not saying that croissants are good for you but let’s face it we’re all gonna eat one now and then. So it can’t be that it’s processed with the germ and the bran thrown away, which is all of the micronutrients and all of the fiber, essentially, and it can’t be that it’s been hybridized, we’ve already discussed the Kamut issue, which definitely calls into question that theory, that the problem with people reacting to gluten is the fact that it’s been hybridized to increase the gluten level. That’s what we were told for many years, right? But there’s another issue. Talk about the issue that may be the reason, that is probably the reason why people can go to France and eat even processed wheat and not react like they do with American processed wheat. Speaker 1: Yeah, I think there’s two main reasons. Number one: I’ll give you the easy one first. People are on vacation and they’re relaxed and when you’re relaxed you increase what’s called the parasympathetic nervous system versus when you’re at home you’re stressed out, and you have an activation of your sympathetic nervous system. The short term, the colloquial term, for the parasympathetic nervous system is the “rest and digest” nervous system. So when you actually sit down, relax, make time to eat your food, you activate the nervous system that can in fact digest. When you’re stretched out on the rug, you literally activate a nervous system that turns off the digestive system. So that’s one. And maybe tat’ not a really convincing argument. But it’s piece to the puzzle let me tell you is very important when you sit down like. Most cultures are all about how Americans need to eat on the run, gobbling here, gobbling here, go go, go go, go go. It’s a real thing and someday we have to look at. But the, probably he more important thing is that the bread that they eat over there is made from scratch. Might be using refined white flower, but it’s made from scratch. And they don’t put any oil in it they don’t processes it, they made it that day [inaudible 00:34:00] croissant at a restaurant in France, they made it that day and by the end of that day it’s going to be hard as a rock and they’re going to make a new set of croissants the next morning. And that’s exactly why people can eat that, this perfect food that the omega-6 fatty acid you put in stuff to make it last for weeks and weeks is the cause of the indigestion. And that’s why people can eat it when eating it relaxed way, I think it makes a difference. But more importantly probably is the non-processed food. Now you can go to grocery stores in Europe and in France, which are popping up all over the place, sadly, and people are not going to the bake … I used to go to France a lot and eat there and you go to the bakery for your bread, the cheese shop for your cheese, the meat place for your meat, the vegetable place for your vegetables. It was just sort of … you had to go to like five shops to get dinner. And that’s sort of changing where bigger … I was there last summer and there were supermarkets with processed bread. If you’re in your hotel and you’re in still little towns you’re still gonna go to the bakery because that’s what you do when you’re down there you’re on vacation you don’t go into the supermarket on vacation. Generally speaking. And you’re going to eat non-processed food that was made from [inaudible 00:35:11]. Even with really refined white flour, which is what a croissant is made out of. Robyn: Okay. But talk a little bit about glyphosate or Roundup and the difference in how much we spray versus other countries. Speaker 1: Well, unfortunately, one of the techniques that I write about in the book is this [inaudible 00:35:31] using Roundup at the end of the harvest to spray it on wheat, basically kill the wheat. And it somehow makes all the wheat berries become ripe at the same time, so it increases their yield significantly. It’s not really being done so much in America. It was being done hugely in Europe and then they shut it down a few years back. So when people had this experience they were probably having, Roundup on their wheat, not to say that that’s good at all, but it’s amazing how we can take our digestive system can take a beating. Little beatings. But yes, there is Roundup everywhere. There’s Roundup on every basically conventional food, even on most organic foods because the rain now has glyphosate in it. So we really can’t get way from that. The glyphosate kills the microbe that make the enzyme to help you digest much of anything, it’s really an important, the toxins in the environment kill the microbes that help the enzymes that help us digest. And of course the processed foods render us unable to digest much of anything. So you put those three together you have the reasons why we’re not digesting our foods and you go to Europe … Hopefully, you know, the bread is generally just made from scratch, that’s the bottom line. If we would just find bread that was wheat and salt and water. And I’ve been to bakeries in France, we did a lot, we spent a lot of time there looking at, I’ve got some really old-school old-fashioned French sourdough recipes in my book that are amazing. It’s just about cooking whole foods and cooking food from scratch and not taking it out of a package. That’s step one. And then try to make it seasonal. Like I put a grocery list together for every month including recipes super food and a grocery list for every month of the year for people to eat seasonal food, for free. I put it on my website, at lifespa.com, it’s called the three-season diet challenge. It’s so important for people to get bugs out of the soil on their food and in their gut, to change their microbiome from the strength of the summer through the fall. And if you don’t, it compromises the immunity it compromises your microbiome. And it’s critically important we get reconnected to those rhythms of nature. Robyn: Alright. You’ve touched on some good things about how to rehabilitate your digestion. I’ve just found that everyone around me has gut issues. My children and I don’t, because of some specific things that we do, but I’d love for you to take us through because I know you’re deep in Ayurvedic principles. You’ve talked about getting prebiotics and probiotics in your diet, which basically means eating plants, wheat being one of those. Tell us some actionable things to rehabilitate our digestive systems. Speaker 1: First thing is, I think, is to really focus in on the gall bladder and the liver, because that’s the insidious congestive organ that is causing us to not be able to digest fried food, not that we should be able. But those are sort of like challenge foods, if you eat those and feel really bad … yeah, that’s not good. So things that are called cologogues will decongest your liver and your gall bladder, are: beets, apples, celery. Like starting your morning with breakfast, with a beet-celery-apple juice, is a great way to start your day. Fenugreek for example has been shown, make a fenugreek tea, has been shown to contract the gall bladder by 75%. Turmeric, you can use it as a spice or in a capsule, has been shown to contract your gall bladder by 50%. Artichokes, powerful cologuge that can cleanse and flush your liver and your gall bladder. All of your leafy greens are really good for flushing your liver and your gall bladder. So when your liver and gall bladder get congested, then you don’t have any bile to buffer the acid so the acid sort of says, “oh boy, I better not make any acid.” Or you live with heartburn and they give you an antacid to shut down your acid for you. Either way, you’re eventually going to have no acid. Does that make sense? So we have to think about the body’s logic. If the body is holding onto acid, and it’s getting a heartburn, it’s doing that because there’s no bile to buffer it. So let’s increase the bile first and then gently and kindly help your body make its own acid instead of just overruling the the intelligence of the body and saying here’s some acid. So if you do get some five spices: ginger, [inaudible 00:40:25], coriander, fennel, and cardamom. Those five spices are pretty amazing individually, and there’s great science to back them up and show the digestive support. But as a whole it’s an ancient recipe I’ve been using for years in my practice. Those five spices actually strengthen the ability for you to make your own stomach acid, make your own biome, make your own duodenal and pancreatic enzymes. To get you to get on [inaudible 00:40:52] better and get off. And you can spice them, I use them as spices in your food, which is something we’ve thrown out the window. We don’t cook with spices very much anymore. And they also are, you can get them in capsule form as well. But powerful support to turn on the upper digestion and then the bile flow, and then you want to do things for the quality and integrity of your intestinal skin, and even most importantly the lymphatic system. Lymphatic system is this unsung system that is linked to the whole “Grain Brain” it’s really a grain drain effect. And we really do need to decongest the lymphatic system. So first step there is the intestinal skin. And I love, I ate tea, we make [cyprium 00:41:35], marshmallow root, and licorice root. And you take, we have it in a chopped form, you take three tablespoons of the mixture, soak it overnight, pour it into water and boil it down to a half a quart, strain it through a metal strainer and you have this thick viscous tea in a jar, put it in the fridge, take a tablespoon of that every couple hours throughout the day. And it coats your whole intestinal mucous membranes like Pepto-Bismol commercial, coating it with this natural prebiotic slime that protects your whole intestinal tract, it’s pretty cool stuff. And then we use foods like Ayurvedic medicine, they use this recipe called Kitchari which is split yellow mung beans and long grain white rice. And that might, “white rice is bad, how could you eat white rice, it’s terrible,” people would think. But the reality is that somebody years go, a thousand years ago, took the husks off the rice by hand, split the mung beans by hand, took the husk off, and cooked these unhusked and dehusked rice and beans with special spices like the ones I just mentioned, for hours and hours to make it into this convalescent soup that they would give to people who are aged or ailing or to the very first food that they give a baby, whose digestive system is just beginning to start. We have cleanses we have in the book and we tell you how to go through and do a detox using Kitchari that will heal your intestinal skin, and then for the lymph on the outside of your intestinal skin anything that would make your skin turn color like a dye, or like a blueberry or blackberry or raspberry or pomegranate or beet. Anything that’s sort of got that dye in it definitely is a lymphatic mover, those antioxidants and those food groups work through the lymphatic system [inaudible 00:43:20] science. So that’s what helps get our lymph system moved for its exercise, as well as staying hydrated is very very important. Robyn: You know, I love the idea of listening to our body and following the seasons and paying more attention to what our body wants, and that’s what Ayurveda helps us do, and so we’re going to put a link in the show now, it’s at greensmoothiegirl.com, we’ll put a link to Dr. Douillard’s book. He’s actually author of quite a few books, and we’ll also see if we can get a recipe or two, he’s talking about such wonderful things about combining ginger cumin coriander cardamom and cinnamon I believe to improve that throughput and increase bile production as part of your strategy to get your digestive health back. So Dr. Douillard tell me a story about … because the way you’re eating, if you’re walking your talk, is so radically different from the average American. Tell me a story about your family and how these principles have helped you to be healthy as you see everybody your age and mine really sick around us, don’t we. He goes, “stop. Have a nice warm-cooked meal in the middle of the day, you’ll never have high blood pressure again. And I said, “oh, come on, really? Give me a dumb Ayurvedic pill, I need to get this fixed.” But I ended up doing it, watching my blood pressure get better, I did a study on it. Saw the results. And that’s what sort of was the first fascination I had about circadian rhythms and how they affect our health. When you eat, science now shows, it’s conclusive: when you eat breakfast and a lunch and a light dinner, significant health benefits. You lose weight, you have more energy, you have less heart disease, lower blood pressure, all the things that I found thirty years ago when I first started doing this. I was like, “Wow!” So the science is catching up to the ancient wisdom. That’s what I write about in my, on my website at lifespa.com, is the … I take ancient principles of medicine and prove them with science. And it’s amazing! I thought I had like one or two articles and I’d be out of business, but I keep finding more and more and more. It’s like unlimited, there’s so much science buried in the journals, that prove ancient wisdom. And you know, when you have something that’s been around for a thousand years that works, and now you have science to prove it. Don’t you think we should at least look at that? I’m not saying it’s gospel or it’s the way everybody should do it, but it’s a lot different than just science funded by whoever funded the study and you never know is that really accurate or not. We have something that’s been done for a thousand years, and has the science to prove it. That sort of to me is a good place to start. And that’s what I write about on my website. And that’s what I live and breathe. Constantly looking for ways to become a better seasonal eater. I don’t think that we have to only eat seasonal food, you’d have to live in a bubble to do that, but I think we should think about eating more of the foods that are in season. Stop thinking about what we should not eat, other than processed food, and think about what we should eat more of. And that’s why I put these grocery lists together. You look at the grocery list for April, and you circle the stuff you want on the list that you like, and eat it! And give yourself permission to eat because it’s in season right now. As opposed to “I shouldn’t shouldn’t shouldn’t shouldn’t” or on some restricted diet that says eat high protein or high fat or high carb or whatever it is, and then we find ourselves binging on what we didn’t have in a season or two later. Because nature gives us a high protein high fat diet in the winter, a low fat diet in the spring, and a high carbohydrate diet in the summer. So if you eat any of those, if you eat high protein high fat all the time, you’re gonna crave the low fat, which is a cleansing season, which is spring, and you’re gonna crave the carbs, and binge on them. And we’ve been down this road before, where people, when we binge on carbs we gain weight! And then we blame carbs on everything. Carbs are the scapegoat for everything. But they’re really important in balance and in season. And that’s what I think both of us are trying to say. Right, Robyn? Robyn: We are, and you and I were discussing 2016’s book by Dr. Michael Greger, who’s an MD. He’s the nutritionfacts.org guy. But he wrote the book, “How Not to Die.” And I was telling you that there’s 130 pages at the end of the book that are his references. So literally thousands of references. And he talks about how … you’ve talked about how ancient hominids, 3.4 million years ago, were eating grains. They weren’t eating meat. People in paleolithic times, the vast majority of them, were eating probably more carbohydrates than Americans do. Different kinds of carbohydrates, of course. You’ve talked about what the real problems are with grains. You’ve talked about seasonal eating. You’ve talked about how Kamut, an ancient grain, has twice as much protein in it as the hybridized grain does, totally blowing up that theory. You’ve talked about so many interesting things. But Dr. Greger also talks about how people who have lived, in the blue zones, that’s not Dr. Greger, that’s [inaudible 00:48:57] but it’s … shown to us that the people who live the longest on this planet eat lots of carbohydrates. And I like how you’re talking about in season. We ebb and flow with what is available to us, as people have for thousands of years. And when we start to think like that, we let go of this death grip we have on counting grams of proteins, fats, and carbs, which has never made sense to me, I never followed that, even in my sick periods way back 25 years ago. But I love the more common-sense approach we’ve gotten from you, I think my readers are going to find that their minds are blown on a lot of the sacred cows in the field of wellness and nutrition that they may have … things that they thought they knew, that they now have to rethink. And I want to say that I have never stopped eating grain. I’m just going to say it. I feel like I’m on Alcoholics Anonymous or something. But I’ve never stopped eating gluten, I have never purchased any of the $16 billion a year worth of gluten-free processed foods that people are buying. It never made any sense to me. You know King Tut’s tomb was full of wheat, it’s called the stuff of life in the Bible for good reasons. Now we’ve got from Dr. Douillard that people were eating it 3.4 million years ago when they were barely standing up. Paleolithic man was eating grains. We need to rethink it. Actually right before you and I talked I ate a sprouted grain like english muffin. And I always look for organic, and I try to look for sprouted. I used to … I raised my kids making, just like you, like you were talking about, it’s part of your book, sourdough breads instead of throwing some quickrise yeast in there so that I could get my bread done in an hour, like nobody has since the dawn of time. There are people eating cereal grains, I learned this from you, that had mortar and pestle thousands of years ago, before people were eating meat, before fire was discovered. And I raised my kids on sourdough whole-grain bread that I’d made. I’ve never had gut issues, I don’t have immune issues, I never get sick in the winter, I have tons of energy, and I eat plenty of gluten. So I’m not a study, I’m not … that’s just one person’s experience, but my 16-year-old son has been saying, because my oldest three kids are grown and gone, he’s been saying to me lately, “Mom, remember that bread you used to make.” And I would just pour some olive oil and a little balsamic, and they would dip the bread in that and, you’re right, it took few days. I don’t want anyone to think, be daunted by that “it took a few days,” because I would make my own sourdough and that sourdough would sit out on the counter and it would keep reproducing itself. It’s not that we actually have to work for three days. It’s that that’s how people since the history of ever have made bread and used grains. And so lots to learn from Dr. Douillard. Tell us where we can find more from you. We’ll definitely put some links to your site. Tell us where we can learn more about you. Speaker 1: Yeah, my website is lifespa, L-I-F-E-S-P-A, dot com. So lifespa.com. And that’s where you can get … I put out three video newsletters a week proving ancient wisdom with modern science, that’s what I do and love to do and of course “Eat Wheat” you can get anywhere, it’s on Amazon and that’s pretty much it. But pretty much most of the stuff on my website is free. All the articles and the videos are free. All the information about how to reboot your digestion, is almost a thousand articles and videos up there for free that can help to reboot and [inaudible 00:52:30] to learn more about how to reset and strengthen your digestion. Robyn: I love it. Well, from discovering you on a beach in Mexico on vacation to this wonderful interview, thank you for your time so much Dr. Douillard. And everybody, go live your high-vibration life! I LOVE these podcasts and I am implementing a lot of new great stuff. My family’s health is improving because of the information you share with us. If I may offer some feedback…. will you please double check to make sure the mute buttons are on when not speaking? I am not sure who it was coming from, but we could hear a lot of background sounds that distracted from the information being given on this podcast. Hi Dora – thanks for your kind words and helpful thoughts / suggestions. Taking it to heart. I wanted to listen to this podcast so bad…It sounded like someone was eating soup while Dr. Douillard was speaking I listened for the first couple minutes and could not continue do to the slurping and background noise. The sound quality was challenging to hear Dr. Douillard in this podcast, but so worth the effort! I’ve been gluten free for about 3 years… initially I tried it to help a stomach ailment, but discovered that it cured my horrible Spring allergies, so I’ve kept with it! I thought I’d have to stay GF forever, but this podcast has definitely made me curious about the possibility of being able to eat wheat again! I was disappointed that Dr. Douillard didn’t talk more about the possibility that many aren’t necessarily intolerant of gluten, but actually glyphosate in wheat. I’d heard that this is the explanation for people being able to eat breads in Europe but not America… And I wish more had been talked about which wheats (brands, etc.) are “healthy”. Maybe he talks more about this in his book. Thanks for the podcast, Robyn! !